EJ 24~96V Deep-cycle Lithium battery series covering 24V, 36v, 48v,72v and 96v. 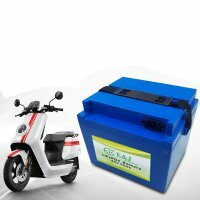 Offering an expansion of our 12V battery range to better fit applications that require more power ranging from E-bike and E-scooters to golf carts, robotics, and power storage. Customized battery packs and development are available. 24V 10Ah 240Wh LifePo4 battery Pack built-in monitor, USB port and charge port.